Terence Loudon (1900-1949). Louden was an accomplished London based flower and portrait painter. 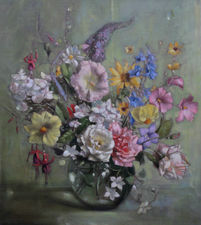 He exhibited between 1921 and 1940; Connells and Sons Gallery 10, Fine Art Society 2, Royal Society of Portrail Painters 1, Royal Academy 10.